We drove 194 miles to Green Point Campground in Gros Morne NP. It was raining all morning and the temperature dropped to 54 degrees F. Gros Morne is best known for its wilderness and spectacular mountain views. 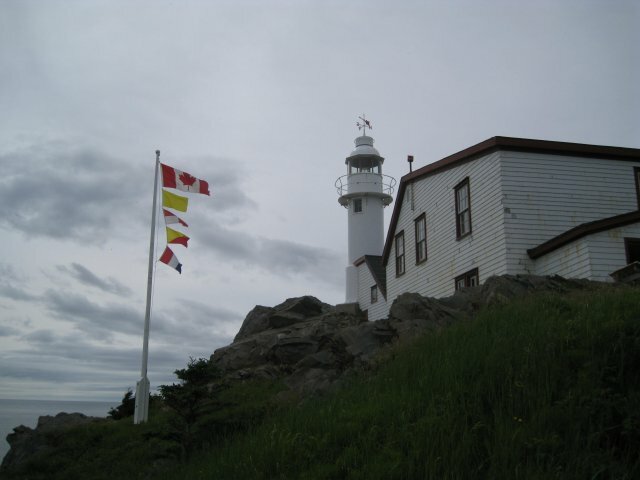 We stopped at Lobster Cove Head and toured the lighthouse (see photo). At Green Point the campground is beside the Gulf of St Lawrence behind a rocky beach. The fishing village of Green Point was taken over by the Parks Service in the 1980's. People received enough payment for their homes so they could build a new house in Rocky Point. The fishermen were able to retain their licenses and allowed to continue fishing from their former homes for $1 per year. Today there are only two fishermen left. They use outboard powered, home made, wooden boats that slide down a wooden track to the water. There are some interesting rocky cliffs along the shore which are used as geological age markers. The layers of rock were laid down over 540 million years and then up-ended 90 degrees so that all the layers for 545 million years can be seen. The layers are full of fossils and are used to date fossils from other locations.